Elite Dangerous has been out now for well over two years, but the updates and content keep rolling in. The latest update is a big one; adding longtime requested features like player avatars and multicrew ships! The latest Elite: Dangerous patch is dubbed 2.3 with a large number of changes. Players can start testing all of that now with the patch during a beta testing phase. Unfortunately exciting elements like the co-op multicrew functionality aren't quite live yet; the patch notes for the test include all of the details on multicrew ships, but also mentions in big bold letters they will be added in a future update. 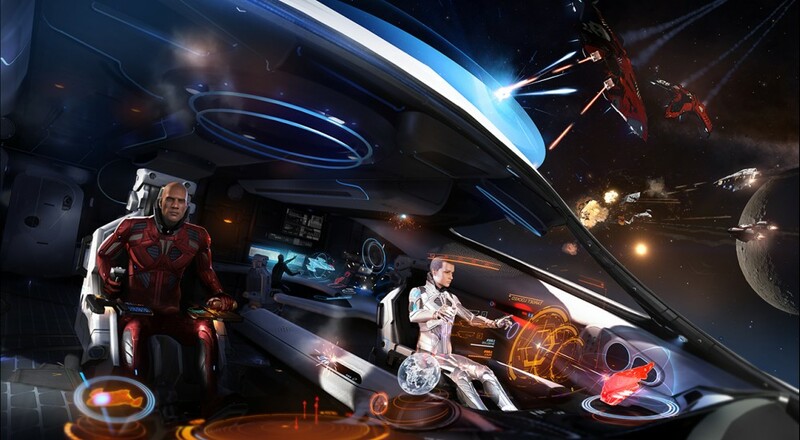 Multicrew ships appear to be designed around three players, with one as the pilot, another as the gunner, and a third taking the role of a fighter pilot that launches from the ship. These roles are tracked on an individual dashboard within the ship showing you your current stats in each role as players complete new bounties as a crew of three. Because this intimate form of co-op has been added, that means you'll want to look the part too. A new "Commander" creator has launched allowing you to customize your character and look the part while doing battle. All of these features will launch on both the PC and Xbox One versions of the game. Page created in 0.3605 seconds.